Between 600 and 900 AD, some 12,000 Mayans inhabited a city in the Valle de Zapotitán dominated by a step pyramid. The grass-covered ruins of the pyramid and a large courtyard were discovered in 1977, and excavation of the site continues to this day. The archaeological evidence suggests that San Andrés was a trading city, as well as the provincial capital. Goods from as far as Honduras, Belize and Mexico passed through the settlement. Residents remained in San Andrés to as late as 1200, and in 1658, the abandoned city was covered in volcanic ash from El Playón, preserving many of the site’s original structures. Today, the archeological park includes a museum showcasing artifacts from pre-Hispanic and Colonial eras. San Andrés is located 20 miles (33 kilometers) west of San Salvador along CA-1. The sign-posted turn off is near the Km 33 marker. During this day trip from San Salvador you will be able to see where the Mayan route began. You will visit Joya de Ceren, an UNESCO heritage Mayan village where you will find the ruins of the ceremonial center of San Andres and its museum. You will also visit the Mayan pyramid of Tazumal and will end the tour with a visit to Santa Ana's city center. Don’t waste time at the airport in between flights – make the most of your layover in San Salvador with this private 4- to 6-hour tour of El Salvador’s Mayan archaeological sites. Follow part of the famous Mayan Route to two equally fascinating sites, Joya de Cerén and San Andrés, and learn how the two settlements were preserved beneath layers of volcanic ash. 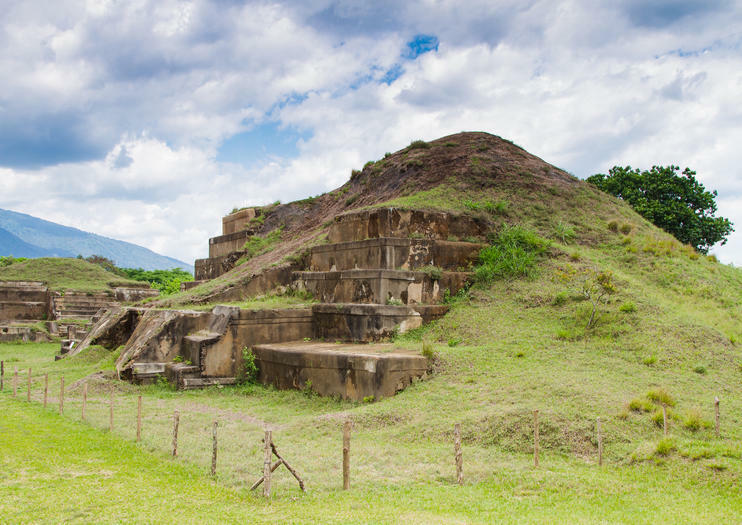 Discover why UNESCO-listed Joya de Cerén is nicknamed the ‘Pompeii of the Americas’ and use your imagination to bring the pre-Columbian farming village back to life. This tour includes pick-up and drop-off at Monseñor Óscar Arnulfo Romero International Airport in San Salvador.